Posted September 19, 2018 & filed under Labor Rate, Parts, Service. Are you looking for the cheapest forklift labor rate out there? Are you shopping for the lowest number? Are you looking at other metrics when you evaluate forklift repair? Let’s explore the right way to evaluate labor rate. The labor rate is the hourly charge to maintain and repair a forklift. As you might expect, rates vary between repair companies. What is often misunderstood is how to evaluate a rate to determine which is the best value. Warranty on repairs – Ask your non-Toyota Dealer Repair technician what their warranty is on the quoted repair before awarding the business. It should be important to your evaluation. Note that the Toyota Warranty covers both Parts and Labor for 2 years, when installed by an Allied Toyota Lift Technician, which is unmatched in the industry. Onsite repair – We come to you. You do not have to bring your unit to the dealership as you would your car. Professional van – Our vehicles are safe, fully marked, and well maintained. Offsite parts inventory – For the less common instance where your repair parts are not on the technician’s van, we maintain a $1 million parts central inventory. And if our warehouse does not have it, 99% of parts can be obtained with a 1-day turnaround from Toyota… even for non-Toyota units. 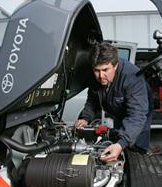 Trained technician – Our technicians are certified by Toyota after hundreds of hours of specialized training. We have three trainers on staff who ensure that every technician is qualified to maintain and repair your equipment. Experienced technicians – our technicians average over 10 years of forklift repair experience. Our trainers and parts/service managers average over 25 years’ experience. 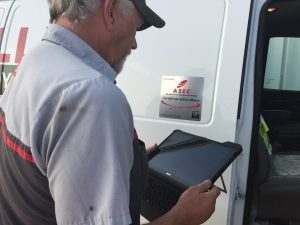 Paperless service system – Our technicians use internet connected tablets to access all customer information including forklift history and parts lists. This speeds up the billing process and makes same day parts ordering a breeze. Let’s look at an example of two labor rates. So, even though the quoted labor rate might be cheaper with another company, Allied Toyota Lift will do the repair work correctly the first time and provide a 2-year warranty, which will guarantee your company will save money and reduce downtime. That is the best deal. Need help evaluating what labor rates work for you? Contact Allied Toyota Lift today. We’re happy to talk you through it. Posted August 27, 2018 & filed under Batteries & Chargers. Maximizing the economic life of a forklift battery is highly dependent on maintenance procedures and maintenance frequency. Few companies have mastered those maintenance processes to their own satisfaction and the resulting shortfall is costly. Below are starting points for you to develop your own “best practices”. Use dedicated and customized equipment, such as a walkie pallet with a transfer carriage installed, to maneuver the battery. Even the lightest forklift batteries weigh hundreds of pounds. Larger batteries weigh several tons. No single person should attempt to move a forklift battery. Always task 2 or more folks and they should be wearing steel toe shoes and eye and hand protection. Position eye and hand washing stations nearby battery changeout areas. Batteries contain sulfuric acid and any splashes of liquids should be neutralized quickly. And should be reported to safety team management. Because of the Sulfuric Acid water mix in a battery protective gear should be worn during any maneuvering of batteries. Chemical-resistant gear should also be worn to protect skin and clothing. You can obtain the correct safety glasses, gloves, and from your local forklift dealer and/or battery dealer. Remove watches, metal jewelry, necklaces, and body piercings when handling and charging or servicing batteries. Battery Charging areas should be well lit and well-marked. This is an OSHA-recommended best practice. 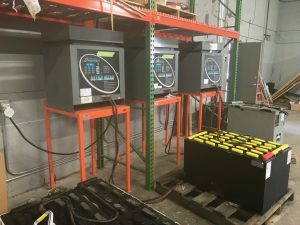 Lead acid batteries can develop a “memory” and should be charged only when they drop below 80 percent depth of discharge. Charging prior that point can result in reduced battery life depending on the type of battery. No battery should be over discharged. That would be below 20% of capacity. Over watering your battery can cause it to overflow. Take time to neutralize the overflow and then dispose of the waste product in a safe container. Keeping your battery clean after a spill/overflow will help prevent corrosion and extend battery life. Any spill that reaches the floor should be reported to the Safety Management Team at your facility. Batteries, and the charger paired with them, should be matched and approved by your local forklift or battery vendor. Matching the charger should include verifying the voltage/amperage needs of the battery and the capabilities of the charger and the facility power supply. One method used to help simplify the matching process involves color coding the connectors between the battery and charger. Additionally, clearly labeling the chargers prevents operator confusion. Proper training is also important and should be done no less than annually. Older and obsolete chargers can allow for overcharging the battery. Modern chargers have battery management systems that will prevent overcharging. Ask your battery vendor or forklift supplier to review your equipment for modern safeguards so you can weigh the risks. A $7,000 battery can be ruined by an obsolete charger. A modern charger is more efficient and can cost as little as $2,500. A great investment in productivity and safety. Battery charging areas need to be in areas with approved temperature ranges. Extreme cold or heat can cause reduced service life and longer charging times. Battery types (lithium, lead acid, etc.) and charging requirements may vary. 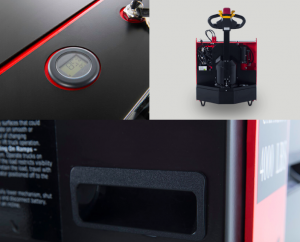 Contact your forklift vendor or battery vendor for the approved charging temperature range. Water of batteries should be done after the charging cycle. Adding water to a wet-cell lead acid battery prior to the charging cycle the battery will often result in creating spills. If available pure/distilled water should be used and the watering should occur after a full charge cycle to bring the electrolytes to the proper level. If the water level is not visible to the person charging the battery the battery should not be charged. You should contact your forklift vendor or battery vendor for remedial steps. Modern chargers (less than 10 years old, most commonly) will not create “safety hazard events” if plugged in or removed from being plugged in improperly. Older chargers will require you to ensure that the charger is turned off before connecting/ disconnecting the battery. Need someone to review your battery charging and care operation for OSHA compliance and safety? Contact the professionals at Allied Motive Power today! Posted March 11, 2018 & filed under Service. What’s inspected during planned maintenance? Toyota’s maintenance plans offer you unmatched peace-of-mind and protection of your investment. 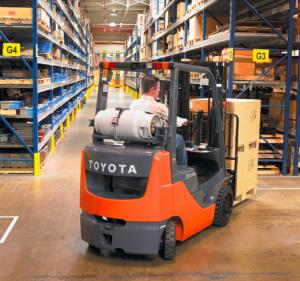 Toyota maintenance plans provide ongoing upkeep of your forklifts and help detect any problems before they turn into something that negatively impacts your business. Depending on the maintenance program you choose – full maintenance or planned maintenance – you can rely on Toyota. 1. 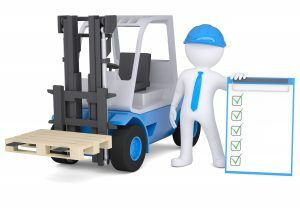 Operation – Does the technician uncover any issues while the forklift is being operated? 2.Physical Inspection – Does the technician see any wear, tear, or replacements needed? 3.Fluids & Filters – What can the technician check, add, or replace to make sure your forklift is running smoothly? All of our technicians are insured, certified, and are enrolled in Toyota developed technician classes that focuses on expert trouble shooting techniques that allow for quick identification of a problem and lift truck repair. Should you need to send your equipment to one of our shops for more complex forklift repairs, you can be confident that our state of the art facilities equipped with the latest diagnostic equipment will repair your equipment back to OEM factory specifications quickly. Planned Maintenance is a thorough inspection made to keep your repair cost low and surprises minimal. For more information on Planned Maintenance, contact Allied Toyota Lift or visit our repair site here. Look for our next blog post: What are the benefits of planned maintenance? Posted January 30, 2018 & filed under New Products. Toyota Material Handling, U.S.A., Inc. (TMHU) recently launched a new AC-powered walkie pallet jack under the brand Tora-Max. The 4,000-pound lift capacity walkie, built for customers in search of an entry-level walkie, provides a simple solution and solid performance. The Tora-Max walkie has a target delivery time of four weeks or less and retails for $2,999. The new product serves small businesses and hand pallet truck users who are ready to step up to powered equipment. Tora-Max also provides a solution to manufacturers with a “no forklift policy” on the plant floor. Tora-Max walkies are available now at Allied Toyota Lift. The name Tora-Max is derived from the word Tora, which means tiger in Japanese. Max stands for maximizing productivity, which is the result of using an AC-powered electric walkie in many applications. To learn more about the new Tora-Max walkie pallet jack, visit Tora-Max.com. Posted November 19, 2017 & filed under Forklift Abuse, Safety. 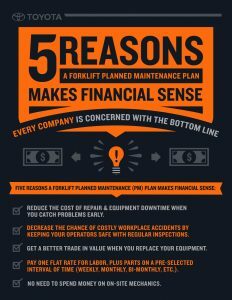 Are you wondering if you have higher than average forklift repair costs? Do your forklifts seem to take a beating by your operators on a day-to-day basis? You may have forklift abuse happening in your workplace. 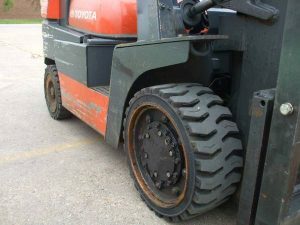 It’s not easy identifying forklift abuse, but with these tips and observations, you can cut down on costly repairs. Description: Debris on the floor can cause damage throughout the forklift. Tip: Make sure your floors are clean and dedicate a resource to monitoring floor conditions throughout the day. Description: Improper operator behavior such as impacts, pushing pallets, and losing control of your forklift can all lead to costly repairs. Tip: Safety training is a great idea to address inappropriate practices and can help your operatorsunderstand better safety practices. Description: Unsafe traveling speeds can cause accidents both on the floor and by raising heavy loads improperly. Tip: Slow down while lifting loads, going around corners, and make sure to sound your horn. Description: Incorrect equipment can cause premature wear, failures, inefficient usage, and high maintenance fees. Tip: Not sure what equipment you need? Ask an expert to help you figure out exactly what you need for your unique job. 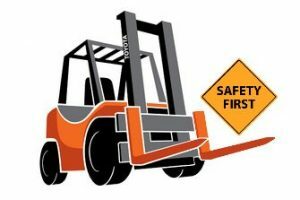 Most cases of forklift abuse can be prevented by properly training your operators with the appropriate safety procedures. Not only is it beneficial to your bottom line, it’s required by OSHA! Allied Toyota Lift offers a comprehensive listing of onsite safety classes. where, or when your forklift is being used! Read our blog post here to discover more about our T-Matics program. Want to find out more? Contact us today or visit our safety training page. Posted September 19, 2017 & filed under Service. Allied Toyota Lift has long had a commitment to the customer. Since our inception almost 50 years ago, we’ve stood by our superior products by using the best parts and technicians Toyota has to offer. Not much had changed over those 50 years in the service department…until now. In 2017, Allied instituted EveryWare, a paperless service system. Saying goodbye to the days of paper work orders and manual updates, the service team now uses tablets and electronic information to manage their day-to-day service requests. Not only can technicians continue to provide that top-notch service you’ve come to expect from Toyota, but now it’s faster, more efficient, and better communicated to every customer we interact with. The Paperless Service System is a field service solution for smartphones, tablets and laptops which completely integrates with Allied’s equipment management system. Technicians can use this service feeling confident that all the data behind it is up-to-date from Allied’s home office. Not only have the technicians noticed an increase in productivity, but our customers have noticed as well. Check out just a few of the top benefits of the new paperless system. 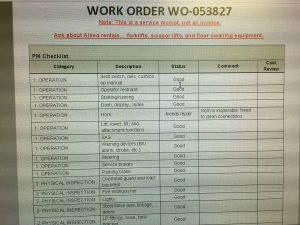 Electronic work orders – Technicians can easily find work orders in the system. Whether it’s planned maintenance, repairs, or a search by customer name, information is accessed quickly and easily making for a faster service experience. No lost paperwork – Because all of the information is electronically stored on the system, there is no more lost paperwork. Gone are the days of writing carbon copy work orders for our customer records. Complete information at hand – Techs have all the information they need at hand. Where a phone call to home office asking for past service history used to be an everyday occurrence, now all it takes is a touch on the tablet for the tech to have everything he needs for the job. Comprehensive equipment information – Everything about the units is accessible on one screen. Equipment information such as hours, warranty information, year, serial numbers, etc. are all easily accessed on one page. No more confusion about equipment details. Complete service history – The unit’s complete service history is saved in one place. Now customers can see exactly what’s been done to each unit and when. What were the hours when it was last serviced? 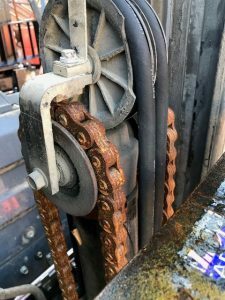 Is there a problem that continues to pop up on a unit? When was its last planned maintenance? Parts history – Now technicians can see every part that has been replaced on a unit and when. Has that bypass hose been replaced more than once? Now we know to take a deep look. Technician history – We can see who has worked on units and when. Reason for service – Was the service for planned maintenance or for something unexpected? This helps build the story of how we can best service customer equipment. Parts requests – A request can now be done in the system instead of a phone call. System “stories” – Techs can choose from thousands of pre-populated service issues to enter as service stories, cutting down on confusion or handwriting mistakes. 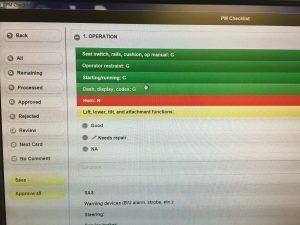 Planned maintenance checklist – A checklist ensures equipment’s critical parts and processes are being checked every time. Mandatory customer reviews – When techs review the checklist, customers have the option to reject, quote, or repair each service issue. This decision record is saved into the service history so there’s an exact record of what each customer chose to do and when. Better quotes – With an exact understanding of the problem and parts involved, our quote experts can better address just exactly what needs to be fixed. Because we have eliminated paper tracking, we can get you your bill faster. No more waiting on our invoicing department to shuffle around those work orders. The Paperless Service System has allowed our service team to spend less time on administration and more time on servicing and maintaining our customer’s fleet of equipment. Allied is committed to our customers and this new system is just one more way we show customers how serious we are about service. Just like Toyota’s quality products, this new system is not easily replicated and we are proud to say is a unique way that we can serve our customers. 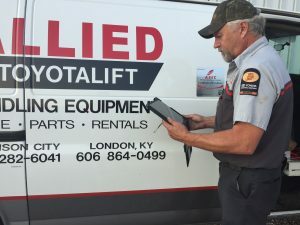 Find out more about our Paperless Service System or the repair services we offer by contacting Allied Toyota Lift today.